Warranty policy is one of the major concerns when customers make decisions. Some car makers' 10-year warranty policy is attractive to many buyers. Therefore, it is very important to make sure that all the major components will meet the claimed warranty. Otherwise, these car makers will face serious losses due to warranty claims. In this article, we will discuss how to design a lab test in order to demonstrate the required reliability in the field for the warranty period. First, we need to learn how the product is used in the warranty period. For example, a car may start 3 or 5 times in a day. 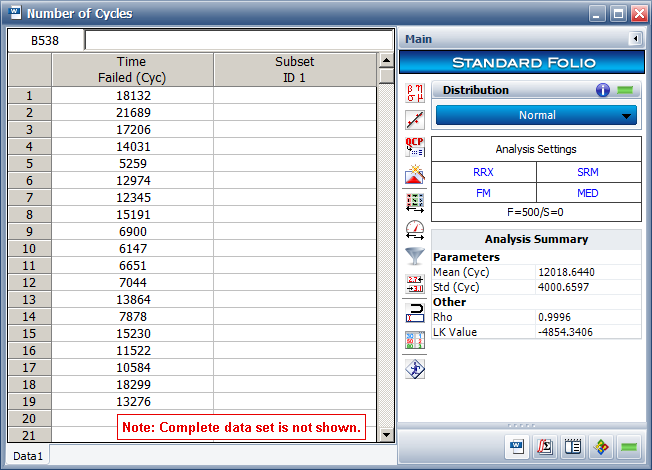 Each customer is different, so the number of cycles of start is a random variable. Customer surveys can be conducted to collect information about the number of cycles. It also can be collected by computers installed in a car. For example, the number of cycles for 500 vehicles over 10 years of use are given below. The calculated usage distribution is a normal distribution with mean of 12,018 and standard deviation of 4,000. Assume the reliability requirement is 90% at 10 years of use. According to this requirement and the collected usage data in section 1, we can determine the design life of the component. The Stress-Strength tool in Weibull++ is used for the calculation. From the failure data of the previous design, we know that a 2-parameter Weibull distribution is used for the failure time distribution of this component. The Weibull parameters are beta of 2 and eta of 25,000 cycles. The reliability of the previous design is calculated using the stress-strength tool in Weibull++, where the stress is the usage distribution in 10 years, and the strength is the failure time distribution. The calculated reliability is 78.28%. Apparently, the old design cannot meet the reliability requirement since 78.28% is less than the required reliability of 90%. Therefore, we need to improve the design. By assuming that the failure mode of the new design will be similar to the old design, we can still use the beta value of 2 for the new design. The eta value should be increased. In other words, we need to move the green curve (failure time distribution) in the above plot to the right. This will decrease the interference between the stress (usage distribution) and strength (failure time distribution), thus to improve the reliability. The question is how much we should increase the eta value. 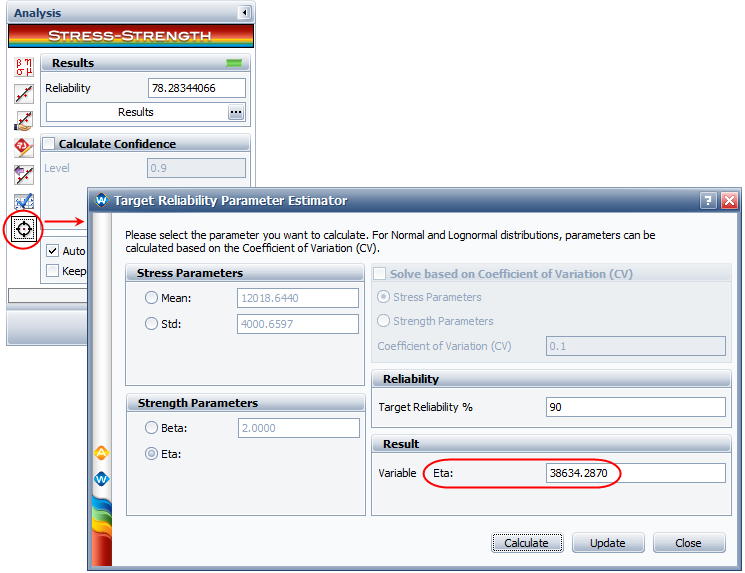 The target reliability parameter estimator in the stress-strength tool in Weibull++ can help us answer this question. In order to meet the warranty reliability requirement of 90%, the target eta for the new design should be at least 38,634. New designs are available now. A lab test is needed in order to validate if the design can meet the warranty reliability requirement. The available resources allow us to test up to 10,000 cycles for each sample. Therefore, we need to set the reliability target at 10,000 cycles for the lab test, such that if the product can meet the reliability target for the lab test, then we can claim that the product also can meet the warranty reliability requirement of 90%. From the warranty reliability requirement in section 2, we know that the eta parameter for the failure time distribution must be greater than 38,634, given that the beta is 2. 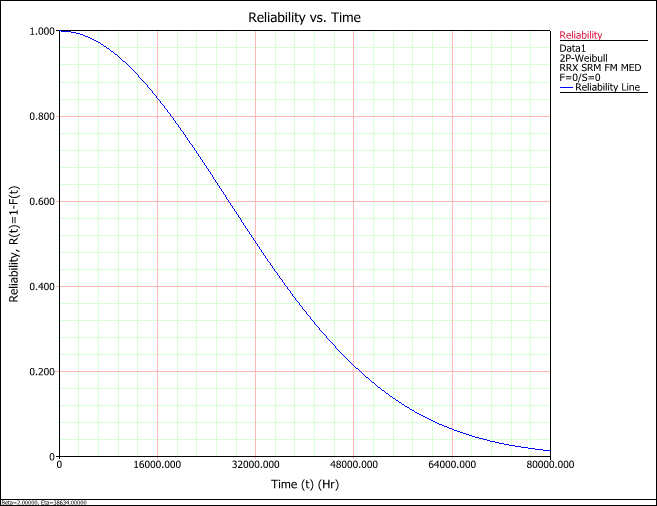 The reliability plot for the Weibull distribution with beta of 2 and eta of 38,634 is shown next. 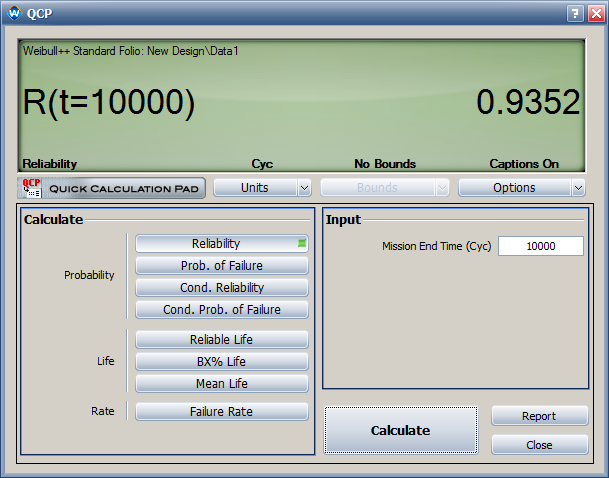 Using the Quick Calculation Pad (QCP), the reliability at 10,000 cycles using the above distribution is 0.935. Therefore, the reliability requirement at 10,000 for the lab test must be at least of 0.935. 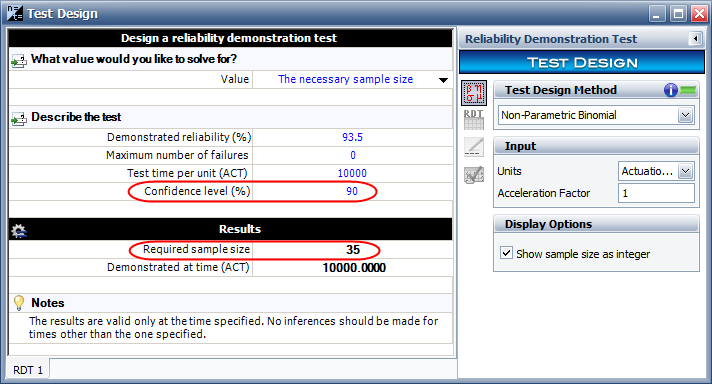 Assume that the confidence level for the reliability demonstration test is 50%. 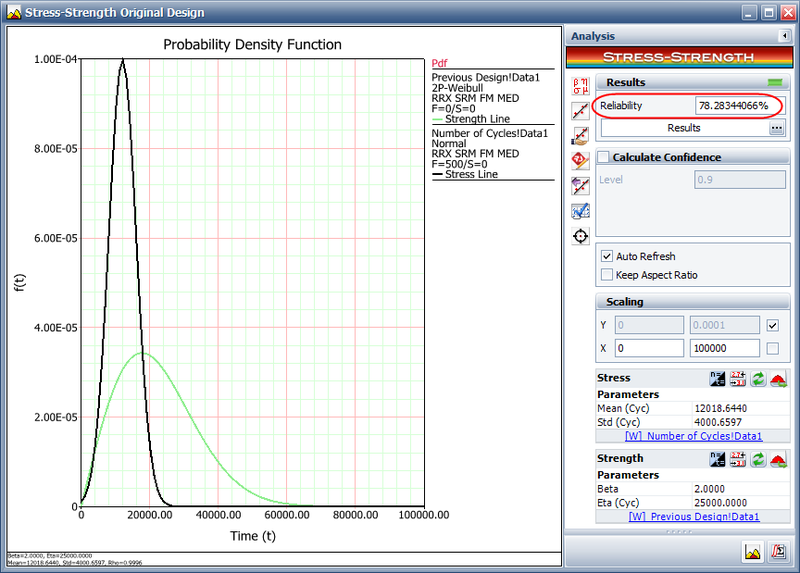 We can determine the number of samples for the lab test using the Test Design tool in Weibull++. The required sample size is 11. This means that 11 samples should be tested for 10,000 cycles each without failure. If all the samples passed the test, then we can claim that this component meets the 90% reliability requirement for the warranty period, with a confidence level of 50%. Of course, we can increase the confidence level. For a confidence level of 90%, the required number of test samples will be 35, as shown next. In this article, we explained how to design a lab test in order to demonstrate whether a product can meet the reliability requirement in the warranty period. The stress-strength method is used since the usage of the product is random. The target reliability of the lab test is determined based on the required strength (failure time) distribution. The method explained in the article is useful for the case when the warranty is in calendar time, but the usage of the product under warranty is random.